For anyone with an online store, driving traffic and generating sales is a constant priority, but you want to make sure you’re using all of the resources at your disposal, while still keeping the amount of effort you’re putting in under control. Incentivizing and rewarding those who are sending visitors to your site is a tried-and-tested way of generating more leads and sales. Although the idea of using an affiliate model to drive sales may seem complicated, it’s actually rather straightforward. What’s more, because affiliate payments are performance-based, you’ll only have to pay out referral fees when a sale has been made and you’ve generated revenue from the referred visitor. You may balk at the idea of paying out a percentage of your profits to those promoting your store, but, if you look at the potential return on investment and lack of financial risk in comparison to other forms of promotion and advertisement, you’ll quickly begin to see the appeal! optional advanced features for your affiliate program. 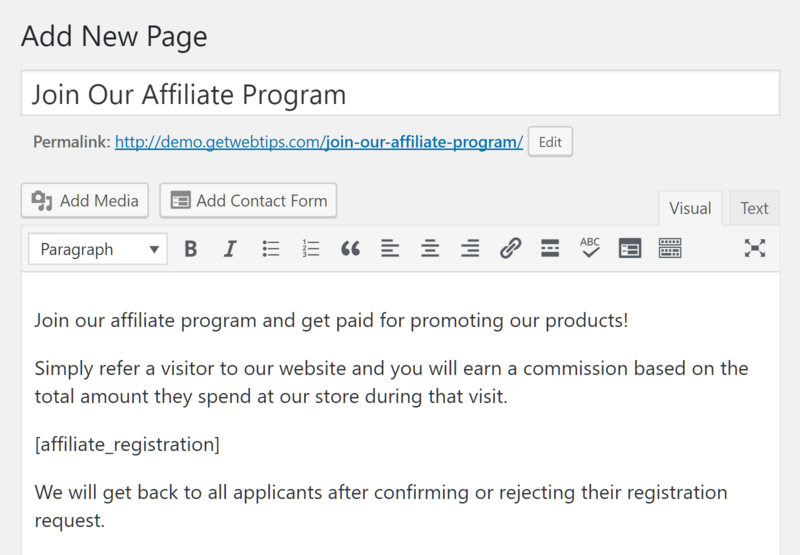 When it comes to adding an affiliate program to your WooCommerce store, one of the very best ways to go about it (if not the very best way to go about it) is to use AffiliateWP: An extremely powerful affiliate marketing plugin we’ve recently covered in a previous review. Not only is AffiliateWP particularly easy to use, it also has a great set of features and a range of useful extensions, and has been built to seamlessly integrate with WooCommerce. If you’re already familiar with the WooCommerce admin pages, then getting started with AffiliateWP shouldn’t be a problem at all. This can be done through the Settings page of the plugin, where you can set the commission rate (either as a percentage or flat fee) choose the currency, and a whole lot more — the likes of which we’ve covered in more detail in our previous article. 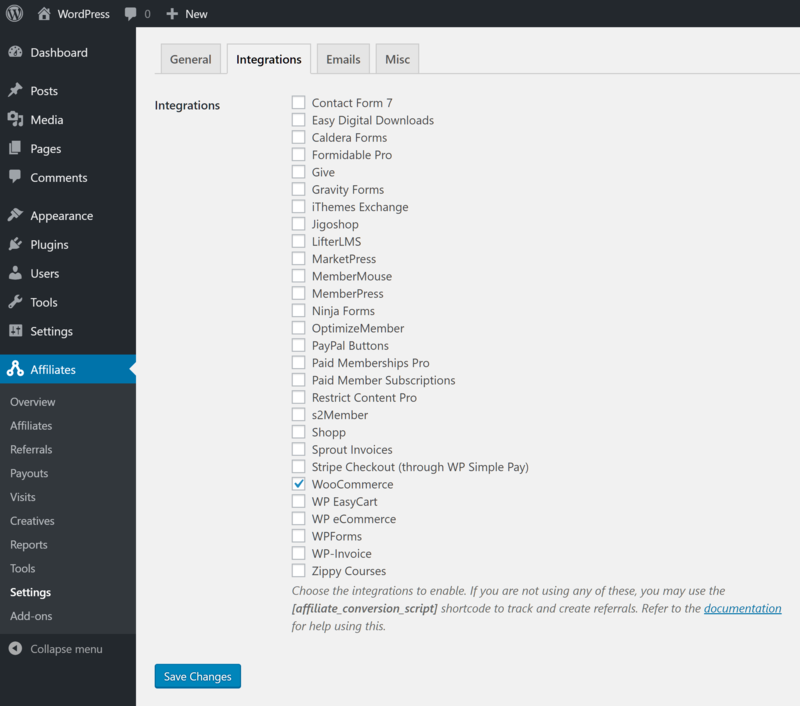 Next, you need to enable the integration with WooCommerce in the AffiliateWP settings. This setting can be found under the Integrations tab on the main settings page of the plugin, and ensures all product sales are automatically tracked by the plugin. With the recent updates to AffiliateWP, the plugin now integrates with even more services than ever. 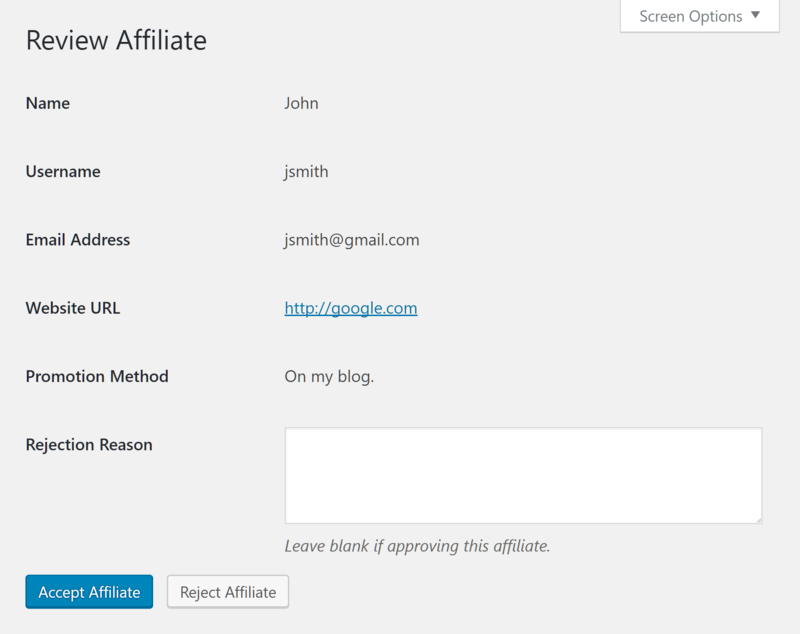 AffiliateWP has been updated to integrate with even more services. Thankfully, enabling this integration is as easy as checking a box. Once it’s enabled, whenever a customer is referred to your store via an affiliate link and makes a purchase, AffiliateWP will automatically generate referral records. When it comes to partnering with the affiliates who’ll promote the products in your online shop, the plugin allows you to manually register affiliates yourself. You also have the option of letting your visitors apply to join your program through the front end of your website. If you want your visitors to sign up for your affiliate program in this way, you’ll need to enable this feature in the AffiliateWP settings. This option can be found under the Misc tab on the general settings page. If you do decide to enable self-registration for your affiliate program, it’s recommended that you also enable the admin notifications and the requisite approval settings. By doing this, you’ll be able to quickly respond to any applications, while still keeping control over who you allow to promote your store and products as an affiliate. You can manage your affiliates and their applications from the Affiliates section of the AffiliateWP plugin on your WordPress dashboard. From here, you can view pending applications, along with those that have already been approved or rejected. Now it’s time to cover how your approved affiliates promote your products and ensure the visitors they send to your store are tracked. 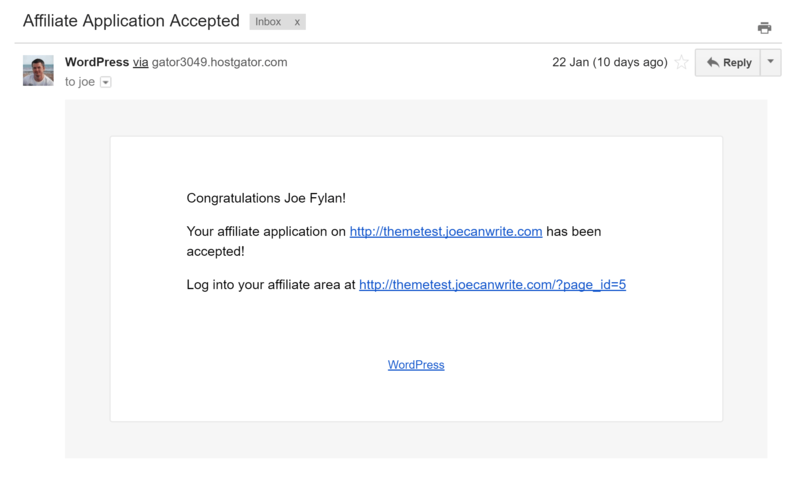 The good news is AffiliateWP takes care of this for you too. When one of your affiliates logs into the affiliate area of your website, they’re immediately presented with the information they need to start adding the affiliate links to their website, or the other locations where they’ll be promoting your store and products. This not only gives them the affiliate URL of your homepage, but also allows them to generate their own affiliate links to individual pages and products on your website. This means they can deep link to the inner pages of your website — allowing them to specifically target particular products and selling points more directly. To use the generated affiliate URL, the user simply needs to navigate their way to a page or product at your store, and then copy the relevant page address. This address can then be pasted into the referral URL generator to give them their unique referral address to use to ensure each of their referrals are properly tracked by your store. Once your affiliates have signed up (having hopefully begun to promote your products using their own referral links), they can then log in to their affiliate dashboard on your website. Through the front-end dashboard AffiliateWP adds to your store, your affiliates can view their statistics, including paid and unpaid referrals, the number of visits to your store they’ve generated, their conversion rate, and both their paid and unpaid earnings. 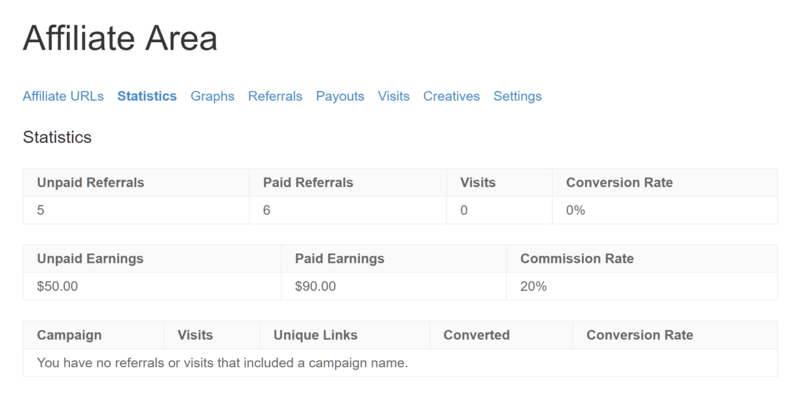 From the affiliate area, affiliates can also view a graphical visualization of various statistics and the details of each of the visits they’ve generated, access any creatives you’ve uploaded — such as banner advertisements — to help them promote your store and products, and configure the email address they use to receive payments and enable referral notifications. If you’d like your affiliates to be able to view detailed information about the orders their referrals have placed, you can install the free Order Details add-on to your site. 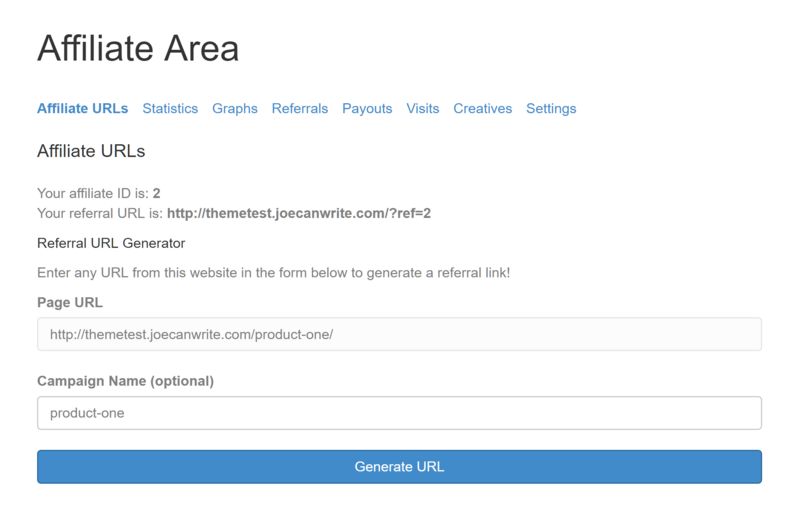 Top tip: To help you get a better sense of how affiliates interact with your website, it’s well worth creating a test account and sending some dummy orders through your store using the affiliate referral links. 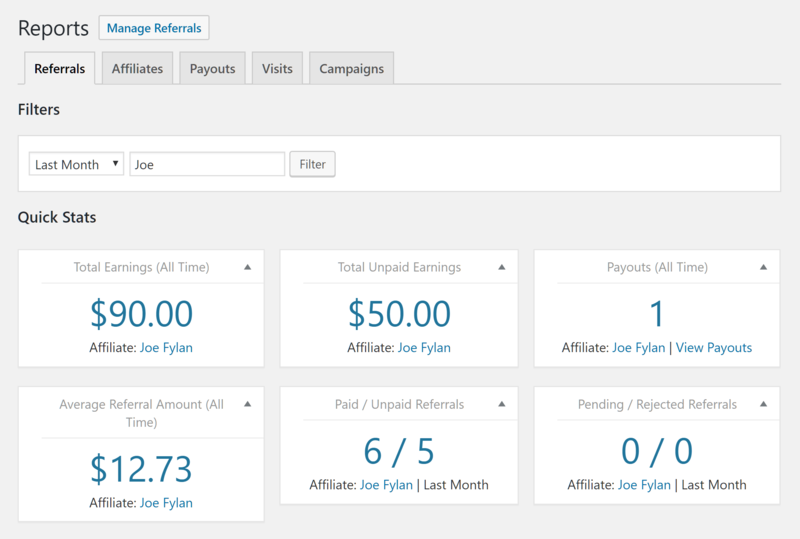 From the Referrals screen, you can view any referrals or sales your affiliates have generated. 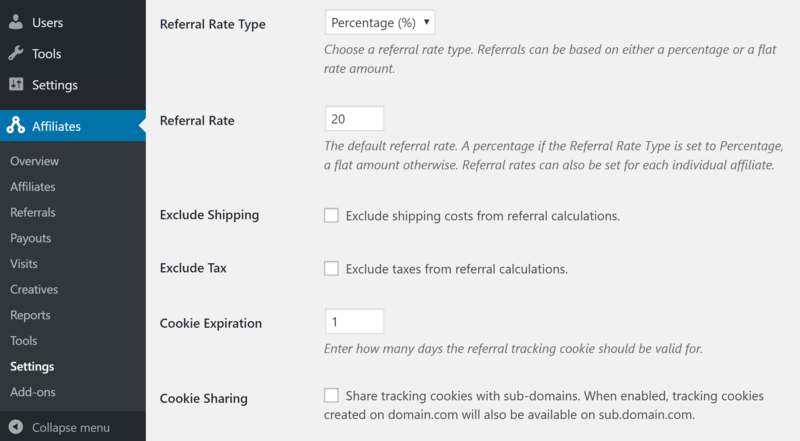 Note: A handy feature of AffiliateWP is that it lets you click through to the individual WooCommerce orders associated with each referral, so you can get more details. From the Referrals screen, you can generate a payout file for your affiliates based on a certain date range, or manage the payments manually. You can also delete or reject any referrals, as well as mark them as paid to change their status. As well as viewing all of the individual referrals your affiliates have generated, you can view referral reports for each affiliate. By doing this, you can monitor their individual performance and see how many visits, referrals, and sales they’ve generated. The latest version of AffiliateWP has added more reporting functionality to the plugin, making it even easier to see how your affiliates are performing. As mentioned above, you can view the sales your affiliates have facilitated, and then generate a payout file based on their performance. By generating this payout file, you can send a mass payment to multiple affiliates at once through a payment processor. Supported services include big players such as PayPal and Skrill/Moneybookers. You can also automate payments to your affiliates by installing one of the appropriate add-ons for PayPal or Stripe. 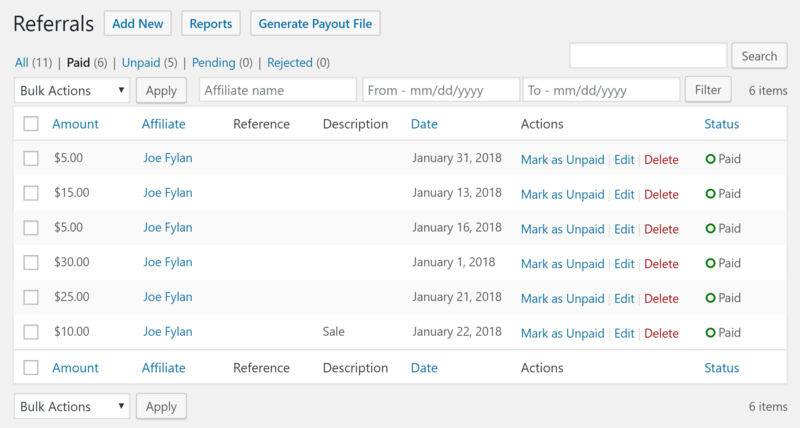 Since AffiliateWP keeps track of who’s been paid and who hasn’t, this takes another task off your hands, thereby simplifying the process of running your own affiliate program. Coupons are a great way for you to not only attract potential affiliates to your program, but to also pass incentives on to their audiences. 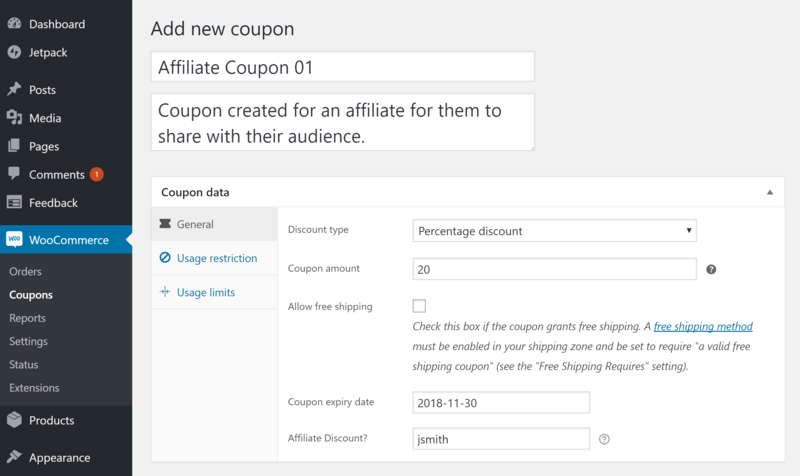 WooCommerce allows you to create discount coupons for your store, and AffiliateWP enables you to associate those coupons with individual affiliates. This gives you the ability to create a coupon for a specific affiliate, which, in turn, can assist in helping you to recruit more affiliates to promote your products. 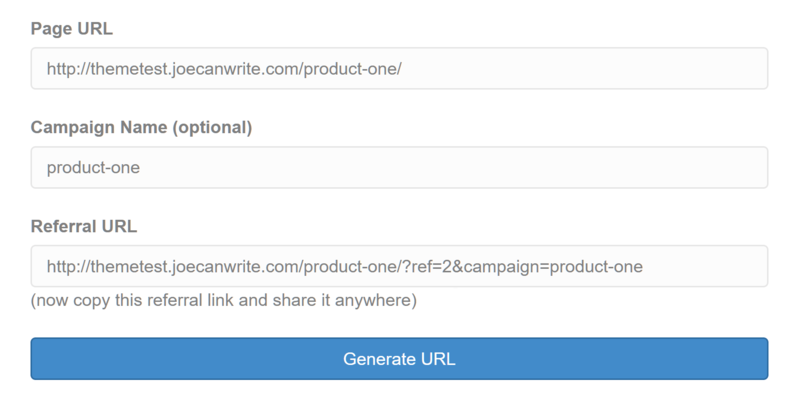 Affiliates can then share a discount coupon with their audience. Affiliate readers get a bonus discount on your products, while affiliates earn themselves a commission in the process. Creating such a special discount coupon is especially useful with high-profile bloggers who you’d like to get on board. Because coupons work independently of referral URLs, they’re also ideal for recruiting podcasters as affiliates, because they can give out their discount code to their listeners while still earning a commission. If you’d like to use this feature, you’ll first need to create a coupon in WooCommerce. From the Add Coupon screen, you have the ability to enter the username of the affiliate to whom you’d like to connect the discount. By following the above guide, you should have your own affiliate program up and running on your WooCommerce online store in no time at all. You’ll also now hopefully have the confidence to take your affiliate program to the next level with some advanced features from AffiliateWP that you may want to implement on your store. Restricting products to certain affiliates: This feature lets you define which affiliates can earn commissions on certain products — a useful feature if you have a popular product that, instead of paying out on all referrals, you’d only like your most valued affiliates to earn commissions for promoting. Disabling referrals for specific product categories: If you have certain product categories on which you don’t want to pay referral fees, you can exclude them from your program. Perhaps you have products that sell themselves without the need for promotion, or those from which you don’t earn much profit and would rather not pay out to affiliates for promoting. This is entirely your prerogative, but be sure you explain this to your affiliates beforehand to ensure they understand they won’t be able to earn a commission on these particular products. Per-product, per-affiliate referral amount: Through the affiliate profile settings, you can override the site-wide commission rate and offer individual affiliates their own personalized rate. This advanced feature lets you set a per-product, per-affiliate rate, with the ability to give a single affiliate their own commission rate for a specific product. This rate works independently from their main referral rate. The PayPal and Stripe payout add-ons mentioned earlier reduce the work involved in paying your affiliates to a single click. These modules give you the option to pay affiliates individually or in bulk. If you’d like to offer your affiliates a greater incentive to promote your products over and above those of your rivals, for example, the Lifetime Commissions add-on can extend the period in which affiliates can earn a commission from their referrals. Now, all future purchases by a referred customer will be credited to the affiliate who sent them to your site. If you’d like to reward your highest-performing affiliates, then you can use the flexible and free Tiered Affiliate Rates add-on to increase the amount your affiliates earn as they generate more orders at your store. The affiliates can move up the tiers depending on the earnings they’ve generated, or based on the number of referrals they’ve accrued. Setting up and managing an affiliate program for your online store doesn’t have to be a daunting task. Using AffiliateWP can help to take the greater part of the effort off your hands, and put your affiliates and their audience to work for you and your WooCommerce-powered online store with relative ease. Can we turn existent users to affiliates ? Nice article Joe, but perhaps you can clarify one thing. How would this benefit someone who is already an existing affiliate with programs such as Commission Junction, LinkShare, etc? Awesome post… Thank Great! 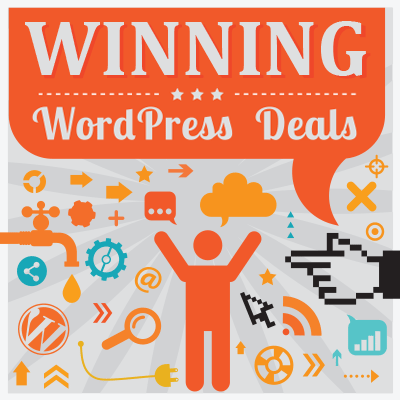 Now I am decided to use WP Affiliate to my new Online Shopping Project. I have woocommerce website http://www.ootyhub.com I need best affiliate marketing plugin pls refer better plugin. This is very good information, It is very useful post about Affiliate Program with WooCommerce Thanks for sharing! 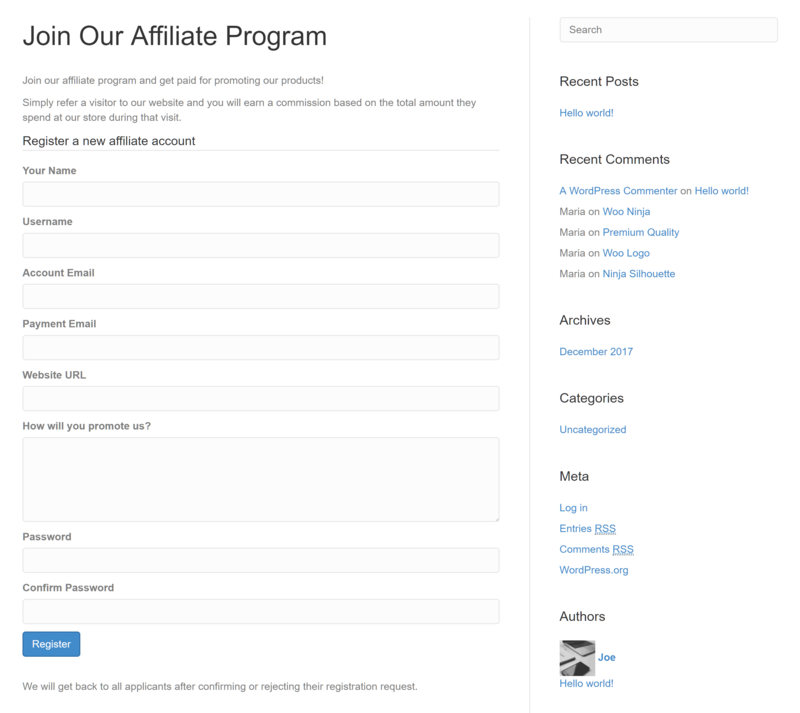 This is just what I was looking for in how to set up an affiliate program. Thank you! There are a bunch of AffiliateWP plugins, which one should I install? Top quality article, thanks Joe!